Beautiful brown pedicure. 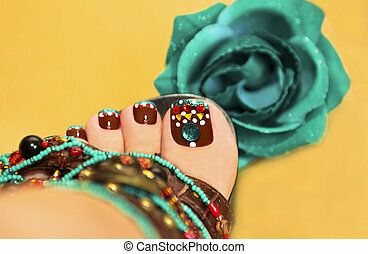 Beautiful brown pedicure with rhinestones and jewelry from beads on a yellow background. Beautiful multicolored pedicure on female leg on a red background. Beautiful luxury pedicure with black and gold brilliant varnish on a red background in gold sandals. 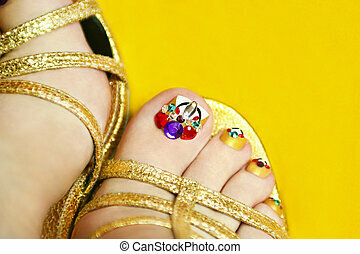 Pedicure on women's legs with crystals in sandals on a yellow background. Winter pedicure with snowflakes and sequins of different colors. 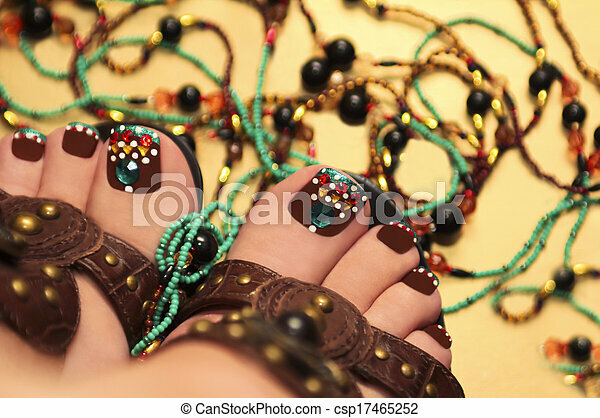 Multicolored pedicure in blue sandals on a white background. Flower pedicure with different shades of nail Polish on a woman's legs. Burgundy pedicure with a picture of the women's nails on a background. Two-tone pedicure yellow and green colours on the background of grass. Water pedicure covered with red and gold lacquer on the feet in the pond. Luxury pedicure with black and gold lacquer on women's toes on the black and brilliant background. Pedicure with different colors of paint on a woman's feet in pink sandals on a white background.